The Schnees Granite mountain boot is a must have for any mountain hunt in North America. 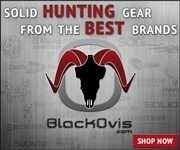 Over my career as a big game hunting guide in B.C.I have had my fair share of good boots. My search for the perfect mountain hunting boot ended the day I bought my Schnees granites. The Vibram sole allows you to trust every step when carrying a loaded pack over trying terrain. At 4.5 lbs per pair these mid weight leather uppers provide ample ankle support without being too stiff and clunky. 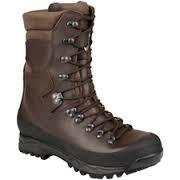 Although these boots are 100% waterproof with their E-vent membrane they can't protect your feet from being sweat wet. Remember to carry spare socks on extended trips and to change your socks at the first sign of wetness from perspiration. Wet feet are a leading cause of blisters and sore feet and can ruin your trip fast. Your feet can perspire 1/4 cup of sweat per day. Use a wool/ synthetic blend sock to help control the perspiration around your feet. Before and after extended use, apply a waterproofing wax to your boots to keep the leather from drying and cracking, extending the life of your boot. Schnees Granites, I use them, I abuse them, I recommend them. Clint Larson ~ Professional hunting guide and Outfitter.